Arguably, Blake Bortles is one of the best quarterbacks in the history of NFL. He impressive play in high school and college which made him eligible for the NFL Draft in 2014 where he was selected as the third overall pick in the first round of the Jacksonville Jaguars. Blake as a student-athlete for UCF led them to a lot of victories including the school’s first major bowl; BCS bowl and also as a professional athlete led the Jaguar’s to their first AFC Championship game. Setting his priorities right in his career, he has made a fortune for himself, nevertheless, his love life seems the opposite of the word successful. Here is everything you should know about the quarterback including details of his love life. Blake Bortles was born as Robby Blake Bortles to a sport-loving family on 28 April 1992. His father, Robert Bortles was active in the game of wrestling and football during his days at high school, while his mother played softball during her high school days as well. His brother, Colby Bortles is skilled with the game of baseball and was drafted in the 22nd round of the MLB draft by the Detriot Tigers. 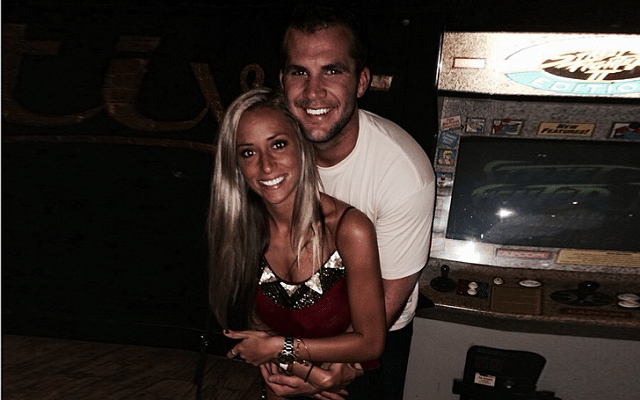 In a bid to get the best education, Blake Bortles was enrolled at Oviedo High School in Florida. While at Oviedo, he became one of the pivot stars in the game of football and baseball. He played excellently well and finished with 5,576 passing yards in addition to 53 touchdowns. Upon graduation, he was named as the number 44 pro-style quarterback in the whole of his class and was also a three-star recruit as listed by Rivals.com. Blake became high in demand for different schools as when it was time for college he got offers from Colorado State, Purdue, Tulane, Western Kentucky, and UFC. After many deliberations, he committed to UFC and also joined their football team. Blakes Bortes collegiate career could be referred to a replica to what he achieved at high school except that he did much better. He joined the UCF football team in 2010 but was redshirted throughout the year. Subsequently, in 2011, he became active after gaining experiences as a redshirt and played in 10 games finishing with 75-110 passes for 958 yards alongside 6 touchdowns in addition to 3 interceptions. The following year, he played as the starter quarterback in 14 games and completed the season with 22-32 passes for 271 yards alongside 3 touchdowns in addition to 79 rushing yards. That year, he was also named the MVP Beef ‘O’ Brady’s Bowl. In the year 2013, Blakes Bortles led the team to a BCS bowl victory with 301 passing yards in addition to 93 rushing yards and 4 touchdowns. The BCS bowl victory was the first major bowl record UCF has ever attained and as a result of that, Blakes was named the Offensive MVP of The Game. At the end of his collegiate career, he recorded 259 out of 382 for 3,581 yards in addition to 25 touchdowns, 9 interceptions, 87 rushes for 272 yards and 6 rushing touchdowns. Blakes started his professional career with the Jacksonville Jaguars as he was selected as the third overall pick in the first round of the 2014 NFL Draft on May 8, 2014. By June 18 that year, he sealed a rookie deal worth $20.6 million for a period of four years. His regular season debut was in a game against the Indianapolis Colts where he completed 14 out of 24 passes for 223 yards, two touchdowns in addition to 2 interceptions and was also named the Starter Going Forward by his coach Gus Bradley. By the end of his rookie season, he had done well for himself as he was a perfect description of a dual-threat quarterback. The beginning of the season in 2015 wasn’t a really good one for Blakes as he recorded a touchdown and 2 interceptions leading to a 20-9 loss against Carolina Panthers but he recuperated and led a victory against the Miami Dolphins where he recorded 273 yards and 2 touchdowns and no interceptions. By the end of the season, he earned the 56th spot on the NFL Top 100 Players in 2016. By 2016 season, Blakes Bortles started poorly but ended greatly as he finished the season with 3,905 yards passing and a 58.9 completion percentage, 23 touchdowns passes, 16 interceptions. The following season was a sweet-sour experience as the quarterback suffered from an injury which took him away from most of the games that season. He returned in the next season and also renewed his contract with the Jaguars for a period of one year. Blake Bortles started the season beautifully and finished 23 out of 36 passes for 293 yards and a touchdown leading to a 24-10 win against the New England Patriots. As the season came to an end, he signed a three-year renewal contract with the Jaguars worth $54 million which would run till 2020 season. Blake’s love life was on a good slate with Lindsey Duke until they recently had a sour experience in their relationship. They had been high school lovers after meeting at Florida and had also continued their relationship through their college days. Trouble started in paradise when Lindsey’s fame surpassed his. The quarterback couldn’t contain his jealousy and decided to call it quits. Rumors have it that Lindsey had over six million searches on search engines while the quarterback was struggling with just 225,000 searches. Anyway, we do not know if this was the real cause of their break up, whatever may be, we sure know that Blake is currently single while Lindsey had long moved on with Ben Higgins.